Julia Roberts: The “Secret” Is Out! The Virginia Film Festival wasn’t kidding when it promised a “secret” sneak preview of a star-studded Hollywood movie last weekend. Producer Mark Johnson — a U.Va. 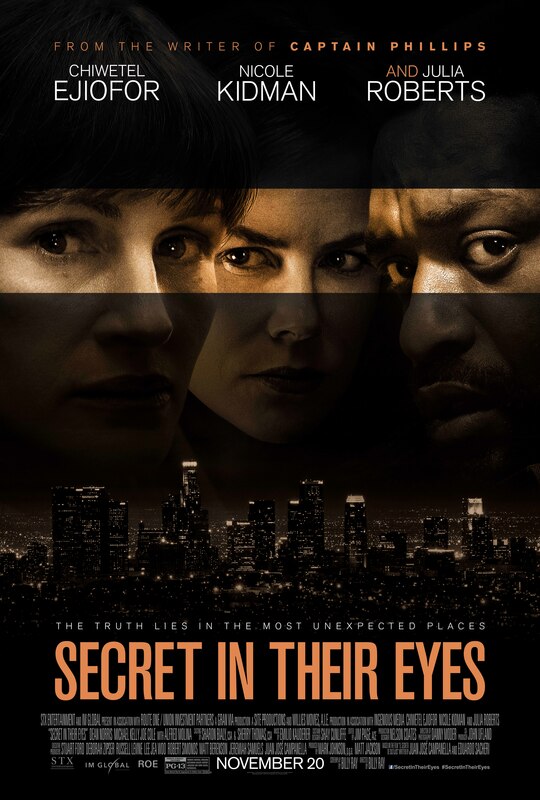 grad, VFF board member and, oh yeah, an Oscar (Rain Man) and Emmy (Breaking Bad) winner — introduced the world premiere of Secret in Their Eyes, the new thriller starring Julia Roberts, Nicole Kidman and Chiwetel Ejiofor. And it did not disappoint. Adapted from the Oscar-winning 2009 Argentinean drama El Secreto de Sus Ojos by writer-director Billy Ray — a master of internecine office conflict from his previous films Shattered Glass and Breach — Secret examines the emotional fallout among a post-9/11 counterterrorism task force after the daughter (Boyhood‘s impossibly lovely Zoe Graham) of one of its officers (Roberts) is brutally murdered. Much will be made about how Roberts goes “makeup-free” for her role as a grieving mother bent on revenge, but her performance is more than just an anti-vanity stunt. “You look a million years old,” Ejiofor’s character tells her at one point, and he’s not exaggerating. Fascinatingly, the film was shot by Roberts’ cinematographer husband, Danny Moder, and perhaps she only trusted him to make her look this bad. Kidman, on the other hand, is luminous as the District Attorney who’s persuaded to reopen the case by the ex-FBI agent (Ejiofor) who’s as obsessed with catching the killer as he is with seducing her. Interestingly, race is never mentioned in the film, although class is — Ejiofor’s character is told that a community-college grad like him would never have a chance with a Harvard-educated lawyer like her. The film’s gender roles are also surprising, especially when you realize (as Ray revealed in a post-screening Q&A) that Roberts’ character was written for a man, and the only change she requested to the character was that she be grieving for a child, not a spouse. An almost unrelentingly grim movie about a raped and murdered daughter, terrorism, and the price of vengeance may seem an odd choice to release right before Thanksgiving (the film opens Nov. 20), but the twisty storyline — which veers far from the foreign-language original — could captivate viewers looking for something more challenging than, say, Love the Coopers. And considering the film was shot in 32 days for a budget of “much less than $20 million” (as Johnson disclosed during the Q&A) means it won’t need to make Oceans 11-like money to turn a tidy profit. Certain scenes may feel overly familiar: Why do cops always shout out a perp’s name before they collar him, allowing him to get a head start on a foot chase? But the top-notch cast, which also includes Breaking Bad‘s Dean Norris and House of Cards‘ Michael Kelly as task force members as well as the always-great Alfred Molina as the shady DA-turned-Governor, glide past the clichés and dive right into the story’s dark heart. To invoke the title of a very different Julia Roberts film, Secret in Their Eyes will certainly leave viewers with something to talk about.